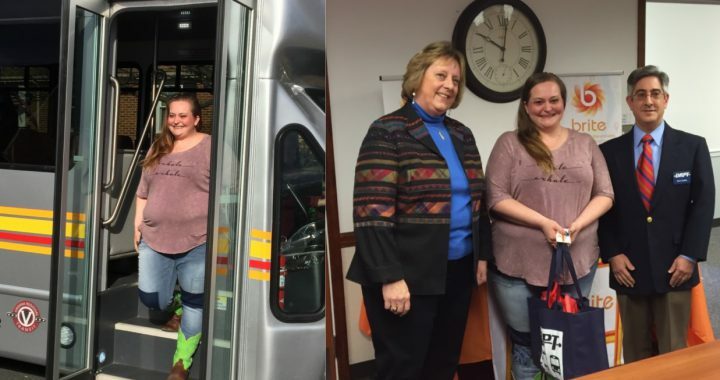 Jenny Cox of Verona, was recently named Grand Prize Winner of the 2017 Virginia Department of Rail and Public TransportationTry Transit Week giveaway. Participants from all over the Commonwealth that took the Try Transit Week pledge during the September promotion were automatically entered for a chance to win a year of free transit service from a participating Virginia transit operator, as well as a pair of round-trip tickets aboard Amtrak’s Northeast Regional train. Ms. Cox routinely rides the BRCC South BRITE route and uses other routes as well to run daily errands. She was presented with a unique one-year pass for BRITE Bus transit at special ceremony in January. Try Transit Week is an annual educational event designed to spread the word about public transportation accessibility and its benefits and to encourage Virginians to reduce their use of single-occupancy vehicles by trying a form of public transportation. Try Transit Week celebrated in Staunton, Waynesboro, and Augusta County with a Free Ride Day on all BRITE Bus routes.